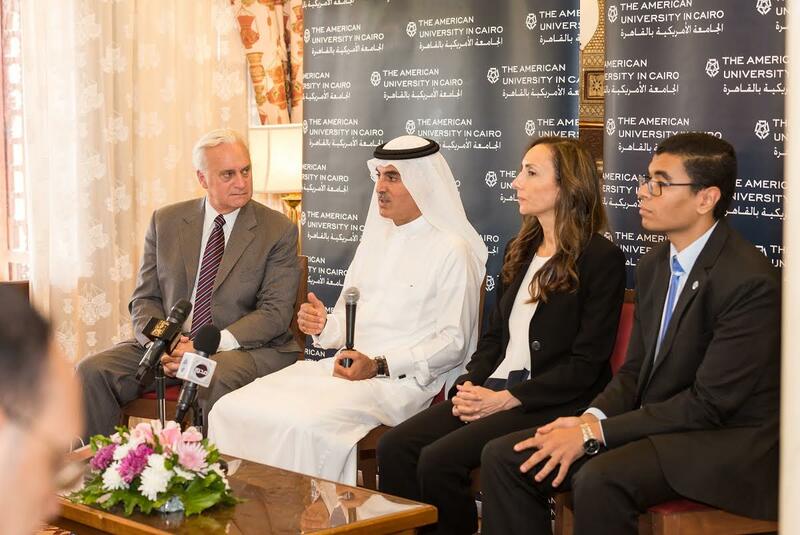 Cairo: The American University in Cairo (AUC) held a press conference yesterday with Emirati businessman and philanthropist, H.E. Abdul Aziz Al Ghurair, CEO of Mashreq Bank and Chairman of the Abdulla Al Ghurair Foundation for Education (AGFE), one of the largest privately funded philanthropic education initiatives in the world, to discuss the foundation’s collaboration with AUC and its educational initiatives in Egypt and the region. Al Ghurair, who was the keynote speaker at the commencement ceremony for AUC’s bachelor’s degree candidates this year, received the degree of Doctor of Humane Letters, yesterday at the ceremony in recognition of his global leadership and dedication to transforming the educational landscape and providing learning opportunities for deserving students throughout the Arab world. Speakers at the press conference were H.E. Abdul Aziz Al Ghurair; Maysa Jalbout, CEO of the Abdulla Al Ghurair Foundation for Education; Francis J. Ricciardone, president of AUC and Yousef Berbar, a student of mechanical engineering of Al Ghurair STEM Scholars Program at AUC. “As Chairman of the Abdulla Al Ghurair Foundation for Education, Abdul Aziz Al Ghurair blazes a new trail for Arab philanthropy, built on his father’s legacy and a deep family commitment to education, said Ricciardone addressing the media. He added that Al Ghurair’s father, who followed in the footsteps of his grandfather before him, constructed the first co-ed boarding school in the Northern Emirates in 1964. Inspired by his faith and a sense of duty to advance the Emirates and the Arab world, his father gave a third of his wealth to establish his family foundation last year. “In his role as the Foundation’s Chairman, Abdul Aziz Al Ghurair bring his business acumen and a results-driven focus that set an example of philanthropy at its best, Ricciardone said. Emphasizing the role of businessmen to give back to their societies, Al Ghurair noted “Philanthropists have an important role to play in our region. We need to work in partnership with government, civil society and the private sector to address the most critical challenges we are facing. We must focus on the best investments we can make, especially education, and insist on results in the same we do in our businesses”. Launched in July 2015 with an investment of $1.1 billion, the Abdulla Al Ghurair Foundation for Education has committed to reaching a minimum of 15,000 Arab youth over the next 10 years, equipping them with the knowledge and skills they need to fulfill their promise as the future leaders of the region. A Memorandum of Understanding (MoU) was signed between the foundation and AUC in 2016 to create opportunities for high-achieving, underserved Arab youth to access and succeed in higher education through the foundation’s Science, Technology, Engineering, and Math (STEM) Scholars Program. A scholarship program was established under the name of Al Ghurair STEM Scholars that targeted high-achieving Arab students, while AUC facilitated academic, career and mentorship support, as well as community service and internship opportunities that Al Ghurair STEM Scholars need to succeed in their education and future employment. AUC is one of only four regional universities to partner with AGFE. Today, AUC is the only partner in Egypt and one of 12 universities around the world, including some of the best schools in Canada and the USA such as McGill University and MIT. The first cohort of students enrolled at AUC for the 2016 fall and spring semester, included 43 Al Ghurair scholars, both undergraduate and graduate students. By fall 2017, the number will increase to reach 100 scholars at AUC, who are bright, performing and deserving students from Egypt and the Arab world. “We are thrilled to be more than doubling the number of students this coming academic year,” said Maysa Jalbout, CEO of AGFE.” “The Abdulla Al Ghurair Foundation in Education and The American University in Cairo are committed to continuing to expand our partnership in service of deserving Arab youth,” Jalbout added. In addition to the 100 Ghurair scholars, AUC offers more than 90 named scholarships supported by individuals and corporations to support underserving brilliant students who are not able to afford education at AUC. This fall, 2720 students received scholarships at AUC. In addition, more than 50 percent of students receive some form of assistance with tuition. Further demonstrating his commitment to service, Al Ghurair is the president of FBN GCC, a nonprofit international network that is run by family businesses, for family businesses. Al Ghurair is also a trustee of New York University President’s Global Council and is on the board of directors of Emirates Foundation. Since 2012, Al Ghurair has been the chairman of the UAE Banking Federation. Moreover, he is the vice chairman of the higher board of Dubai International Financial Centre, and chairman of Masafi Company and Oman Insurance. Al Ghurair has received numerous honors and recognitions for his leadership in business and philanthropy, such as the Innovator of the Year and Lifetime Achievement Awards from Gulf Business Industry Awards, Best CEO Award from CEO Middle East magazine, Lifetime Achievement Award from The Arab Bankers Association of North America and many more. Founded by Abdulla Ahmad Al Ghurair in July 2015, the Abdulla Al Ghurair Foundation for Education provides high-achieving, underserved Emirati and Arab youth with unrivalled educational opportunities. The Foundation’s board of trustees is chaired by His Excellency Abdul Aziz Al Ghurair, Abdulla Ahmad Al Ghurair’s son. The Foundation’s primary focus is to create opportunities for at least 15,000 promising Arab youth from underprivileged backgrounds and help them prepare for university, work and life. With an initial budget of AED 4.2 billion over the next 10 years, the Foundation awards scholarships based on a highly competitive process.